This programme is primarily aimed at Diagnostic Radiographers although the individual modules, if studied ‘stand-alone’, are applicable to a wide range of healthcare professionals. You're able to combine modules from different clinical areas, such as: image interpretation, reporting, or breast imaging, to build a postgraduate portfolio culminating in a research dissertation to complete the Masters. Online distance learning option: Study through online distance learning, or blended learning at a flexible pace to suit your career development and lifestyle. Professional links: Connected with the Society & College of Radiographers, and the National Breast Screening Training Centre at King’s College NHS Foundation Trust. Career prospects: Completion may be used as evidence to support career progression, particularly where making reliable decisions from radiographic images is desirable or essential requirement. Evidence-based practice: Develop your research skills and critical thinking. Conduct a research project, laying the foundations for future research work and clinical practice as an evidence-based practitioner. Emerging technologies: Cover the latest theoretical and clinical developments relating to diagnostic imaging to better meet society’s changing demographic health needs by using emerging technologies and more innovative and creative working practices. 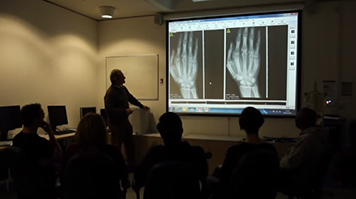 This post-registration programme in Diagnostic Imaging is intentionally flexible; modules may be studied in any order and at your pace (provided all modules for an award are completed within a six year timeframe). You can also choose between modes, studying everything through distance learning, on-site, or a flexible combination that best meets your needs. You'll meet with your personal tutor/course director each semester to discuss module choice and review your progress. Flexible module-by-module study through CPPD route, take a single module at-a-time building up to the above qualifications. Open the pop-up module table to see which modules are mandatory or options for PgCert, PgDip and MSc. Also see which modules are taught through blended-learning with an element of on-site teaching - and which are available 100% distance learning. View large pop-up module table. Some compulsory skills sessions may take place in the evening. This module is mandatory for students studying the PgD/MSc pathway. This module is available online or taught. This module aims to develop a comprehensive understanding of key concepts and methods in health and social care research together with the skills to find, appraise and use the evidence to address policy and practice issues. It is available in taught or distance learning formats. This module is core for all students studying the PgC/PgD/MSc pathways. The aim of this module is to enable health care professionals to develop an understanding of the principles of image perception and decision making factors, awareness of error by investigating the ways in which decision making error occurs in diagnostic imaging relative to the common processes adopted in clinical practice. The implications for practice are considered from abnormality signalling through to written reporting, for integration within a modern healthcare system. Assessment: 4000 word essay. Students undertaking the MSc pathway should choose between the 40 or 60 credit dissertation module. This module is available online or taught. This module enables the student to plan and conduct an in-depth investigation of a topic that contributes to professional practice. It provides the opportunity to apply an understanding of research methods to the investigation and allows demonstration of their ability to work with relative autonomy in undertaking a sustained, in-depth piece of independent learning. It promotes the dissemination of findings to the relevant professional community. This module is ideally suited to any Healthcare Professional who needs to interpret radiographic images as part of their working practice. The aim of this module is to develop skills in preliminary clinical evaluation, specifically enabling interpretation of musculoskeletal radiographic appearances of the appendicular skeleton, with a particular emphasis on the acute and emergency setting. Assessment: 90 minute OSCE. This module is ideally suited to any Healthcare Professional who needs to interpret radiographic images as part of their working practice. The aim of this module is to develop skills in preliminary clinical evaluation, specifically enabling interpretation of musculoskeletal radiographic appearances of the axial skeleton, with a particular emphasis on the acute and emergency setting. Assessment: 90 minute OSCE. This module is ideally suited to any Healthcare Professional who needs to interpret radiographic images as part of their working practice. The aim of this module is to develop skills in preliminary clinical evaluation. Specifically enabling interpretation of radiographic appearances of the abdomen and pelvis in relation to alternative imaging modalities and the patient pathway, with a particular emphasis on the acute and emergency setting. Assessment: 4000 word case study. This module is ideally suited to any Healthcare Professional who needs to interpret radiographic images as part of their working practice. The aim of this module is to develop skills in preliminary clinical evaluation, specifically enabling interpretation of radiographic appearances of the chest, with a particular emphasis on the acute and emergency setting. Assessment: 90 minute OSCE Image. This module is ideally suited to any Healthcare Professional who needs to interpret CT Head images as part of their working practice. The aim of this module is to develop skills in CT image interpretation and preliminary clinical evaluation with a particular emphasis on the acute and emergency setting. Assessment: 90 minute OSCE Specialist Skills. The aim of this module is to develop skills in preliminary clinical evaluation, specifically enabling interpretation of radiographic appearances of the skeleton, chest, and abdomen, with a particular emphasis on the acute and emergency setting. Assessment: 4000 word reflective portfolio and 90 minute OSCE. The aim of this module is to develop skills in breast imaging and meet the requirements of BreastScreen Singapore (BSS) to work within the nationwide breast cancer screening programme initiated and governed by Singapore Health Promotion Board (HPB). Assessment: 4000 word reflective portfolio and 90 minute OSCE. Specialist modules from the PgC Breast Imaging course and the PgC/PgD Radiographic Reporting course can also contribute to the PgD/MSc Diagnostic Imaging awards. This module enables Radiographers to achieve competence in the practice of radiographic reporting of the axial skeleton. Assessment: progression test (P/F); 120 minute OSCE. This module enables Radiographers to achieve competence in the practice of radiographic reporting of the appendicular skeleton. Assessment: progression test (P/F); 120 minute OSCE. This module concentrates on the contribution of specialised modalities in confirming or contributing to the diagnosis and further investigation of musculoskeletal plain image reports. Assessment: Presentation of Academic Poster. This module enables Radiographers to achieve competence in the practice of radiographic reporting of the chest. Assessment: progression test (P/F); 120 minute OSCE. This module facilitates clinical mammography training. In combination with Mammography Practice it fulfils the requirements for the College of Radiographers Postgraduate Award in Mammography (for UK based Practitioners only). This module is suitable for Practitioners working within the National Health Breast Screening Programme (NHSBSP), symptomatic clinics and the private sector. This module facilitates clinical mammography training. In combination with Mammography Theory it fulfils the requirements for the College of Radiographers Postgraduate Award in Mammography (for UK based Practitioners only). This module is suitable for Practitioners working within the National Health Breast Screening Programme (NHSBSP), symptomatic clinics and the private sector. This module provides the range of clinical skills and development required for practitioners who wish to engage in the interpretation and comment on mammographic images. It provides important role development in this area and facilitates elements of advanced practice in mammography. This module provides the range of clinical skills and development required for practitioners working within the Breast Unit who wish to develop specific knowledge base and skills set in clinical breast examinations and respond to the communication needs of the patient (female or male) requiring or requesting breast care. It provides important role development in this area and facilitates elements of advance practice in breast imaging and breast care. This module is for Practitioners who wish to attain competency within the field of breast ultrasound. Students should have regular access to a breast imaging department and participate in weekly breast ultrasound clinics. Students studying this module should already hold a recognised qualification within the field of ultrasound (general, obstetrics or gynaecology). This module is for Practitioners who currently do not hold a general or obstetric/gynaecological qualification in ultrasound but wish to attain competency within the field of breast ultrasound. Students should have regular access to a breast imaging department and participate in weekly breast ultrasound clinics. This module is to enable Practitioners performing breast ultrasound examinations within a Breast clinic to become competent in ultrasound guided interventional procedures e.g. breast core biopsies, fine needle aspirations etc. Intravenous Administration of Pharmaceutical Substances for Diagnostic or Therapeutic Purposes. Taught only. This module provides an opportunity for learning and skills development in intravenous administration to patients of drugs and other substances for the purposes of diagnostic and therapeutic interventions. This module will be of particular interest to allied health professionals involved in mentoring students or staff. The module incorporates theory and practice to develop mentorship skills (communication, goal setting, assessment, feedback, and reflection) and knowledge (learning styles and theories, learning environment, professional, personal and practice development). Students may choose between the online the taught versions of this module. Recent policy developments put innovation and quality improvement at the top of the health and social care agenda, The focus on delivering high quality care, centred around the patient or service user is essential. Healthcare and allied health professionals now have the opportunity to make a tangible difference to their service delivery through the acquisition of knowledge, skills and competencies which underpin the leadership and management of service improvement. This Module explores key factors which together enable professionals to begin to critically reflect upon their current service and to design and implement innovations and changes in health and social care services. Students will be able to explore theories and models of leadership and contemporary healthcare leadership models to develop their understanding of the role of leadership in delivering a high quality service. This module prepares students to demonstrate an active leadership and consultative role regarding ethical/legal/professional issues and best interests decision making within all clinical settings. The module provides the student with a legal and ethical framework for professional practice by developing a robust and analytical understanding of key legislation relevant to a variety of patient/client groups (service users) and an awareness of the ethical tension between the protective use of authority and the principle of empowering practice. A robust understanding of the Mental Capacity Act 2005, ethical and legal frameworks and appropriate clinical guidelines and policies will be developed along with a strong emphasis upon consultative, team working and decision-making skills. Key issues such as medical negligence litigation, consent/refusal of treatment and contemporary debates such as euthanasia, abortion, organ donation, the human genome project, cloning, behaviour control and other topical issues will be examined enabling the student to demonstrate professional leadership regarding contemporary health and social care debates within society. Description as follows: This module allows the student to investigate an area of their own choice, relevant to their field of practice. This module is delivered in the form of learning negotiated between the student, module co-ordinator and practice manager. The student will develop a negotiated, study management plan with agreed outcomes (learning contract). The contract is largely student managed with tutorial support from the module co-ordinator. Learning contracts combine several elements of planning, especially setting objectives and outcomes, devising criteria and formulating action plans. The learning that has been negotiated is an agreement to undertake a specific course of action leading to learning and professional development. Students may choose between the online and taught versions of this module. This module explores a range of leadership perspectives for AHPs, to develop leadership behaviours and change management skills. This module offers health and social care professionals, working in a variety of settings, the opportunity to reflect upon and further develop counselling skills to address the on-going issues pertinent to the current client population. This module will be of particular interest to healthcare professionals practising therapists who are planning to work with students in higher education or who have an active interest in teaching in pre-registration allied health education. This module introduces and explores concepts such as Intellectual Property (IP), entrepreneurship, social enterprise, business development, marketing, outcomes and networking from an AHP perspective. Students may choose between the online and taught versions of this module. This module will introduce students to the topic of economic evaluation and provide them with a basic critical, conceptual and theoretical understanding of the processes involved in economic evaluation. In 2011 the Department of Health identified that the development of advanced practitioners within allied health professional’s (AHP) could result in a significant contribution to high quality clinical care, organisational management, economic sustainability, productivity and all aspects of quality – patient safety, patient experience and the effectiveness of the care that patients receive. Provide you with the opportunity to critically reflect on theory, contemporary research, and evidence-based practice related to diagnostic imaging procedures in order to inform your professional practice and enhance stakeholder experience. 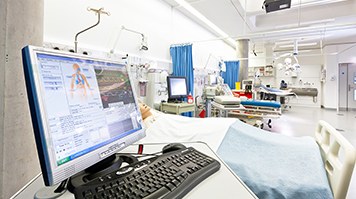 Develop your advanced knowledge and skills through the critical appraisal of theory and practice related to a range of diagnostic imaging modalities and procedures relevant to current and future roles within the context of UK and international health provisions. Help develop the skills that will support you to actively engagement in the process of lifelong learning (CPPD) through critical reflection, to enhance both your professional practice and future employability. Enable continued professional development through independent and multi-disciplinary learning, thereby demonstrating maintenance of the standard of proficiency articulated by the Health and Care Professions Council (HCPC) and other relevant professional bodies. Professionals undertaking this course will be able to use their knowledge and skills to enhance the service they provide in accordance with their employer's policies. Completion may be used as evidence to support career progression, particularly where making reliable decisions from radiographic images is desirable or essential requirement. 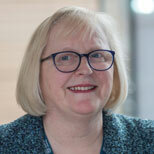 Jenny Jones is a Senior Lecturer and Postgraduate Course Director in radiography. 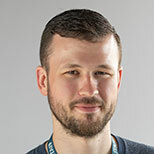 Michael Williams is a Lecturer in Diagnostic Radiography in the School of Health and Social Care. Radiography students at London South Bank University benefit from a new diagnostic radiography X-ray facility after the opening of the Fujifilm D-EVO suite. A major feature of our Southwark campus is K2, a new eight-storey building, designed and constructed using the latest in green building technology. A degree or diploma in diagnostic radiography or any other relevant professional qualification. Students must be registered to practice as a health practitioner in accordance with the professional requirements of their country. Professional qualifications. Students must be registered to practice as a health practitioner in accordance with the professional requirements of their country. If English is not the first language, students must have an IELTS average score of 7.0 on entry into the course. No individual elements should be below 7.0. All self-funding students intending to undertake the PgDip and Masters should first apply for the PgCert via UKPass. Students successfully passing the PgCert can then apply to the University directly to continue their studies and enrol on the PgDip and MSc. Each module is available as CPPD to working healthcare professionals sponsored by their employer. You can apply for the range of CPPD Health and Social Care courses on offer through our CPPD online prospectus where you can also browse through our programmes and modules. You can use the easy search facility or use one of the shortcuts to the professional groups. By clicking on the programme or module you are interested in you will be shown information on the course itself, including dates delivered. You will also be able to apply online, with no need to fill out lots of paperwork. Apply within five minutes using our system, and if your employer has offered to fund you, our system will even get their authorisation before your application is processed. Your application will be processed with ease and you will receive an e-mail at every step of the process. Browse our online CPPD prospectus and apply now. Full-time/part-time self-funding postgraduate students and research students apply through the UK Postgraduate and Statistical Service (UKPASS). Full details of how to do this are supplied on our How to apply section for postgraduate students and our How to apply section for research students. Postgraduate applicants are required to provide up to two references as part of their application. Students should apply for accommodation at London South Bank University (LSBU) as soon as possible, once we have made an offer of a place on one of our academic courses. Read more about applying for accommodation at LSBU. It's a good idea to think about how you'll pay university tuition and maintenance costs while you're still applying for a place to study. Remember – you don't need to wait for a confirmed place on a course to start applying for student finance. Read how to pay your fees as a postgraduate student. Book a session with one of our specialist Postgraduate Advisors. Over a one on one Advice Session they'll advise you on postgraduate degrees at LSBU that match your interests and experience. Book an Advice Session. The fee shown is for 2018/19 and is given as a guide. The fee for 2019/20 will be published shortly. Please visit again soon for the updated fee. For more information, including how and when to pay, see our fees and funding section for postgraduate students. If you are starting a Masters course, studying either full- or part-time, you may be entitled to apply for a postgraduate study loan. Find out more at our postgraduate fees and funding section. We offer several types of fee reduction through our scholarships and bursaries. Find the full list and other useful information on funding your studies on the scholarships and fee discounts page. Many of our students are funded through their NHS Trust or employer. If you are being funded by your employer,please check with your line manager before making your application. You will need to know how your fees are being paid before applying. We help our students prepare for university even before the semester starts. To find out when you should apply for your LSBU accommodation or student finance read the How to apply tab for this course.